Maybe it was just a desire to feel important, my fellow cast member’s pep talk before the Equity meeting, or my compulsive overachieving, but I found myself volunteering to be the Actor’s Equity Deputy on The Crucible before I knew it. And then, suddenly, I found myself to be the 4,000 Miles Deputy because there were only 4 members of the cast — one was just joining Equity, and the other two were pretty adamantly against taking on the job. So with two Deputy positions under my belt now, I bring my Deputy “expert” knowledge to you. 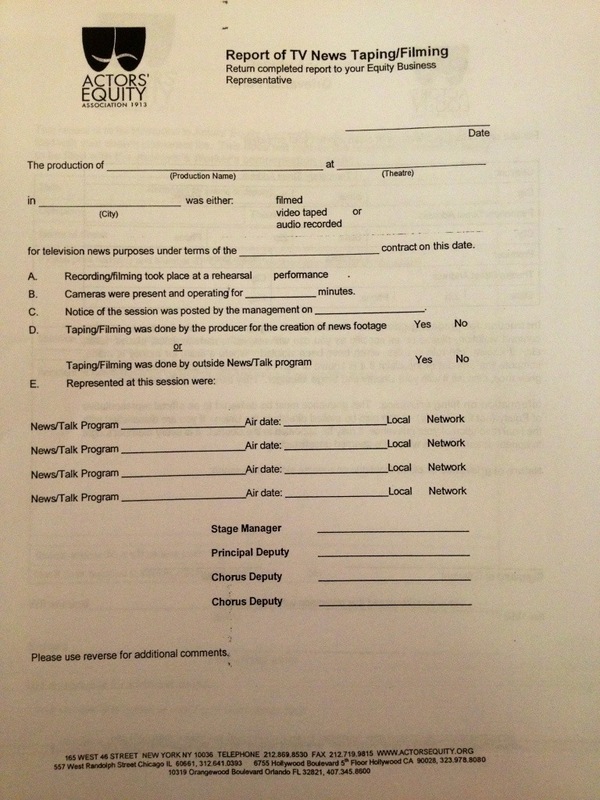 As the cast Deputy, you serve as the liaison between your cast and the union.You take actor concerns to the stage manager, fill out paperwork to help keep Equity in the loop about your production, are the mediator in disputes with the producers, may be called upon to organize secret ballots amongst the cast about contract concessions, and are the cast “leader,” so to speak. But honestly? 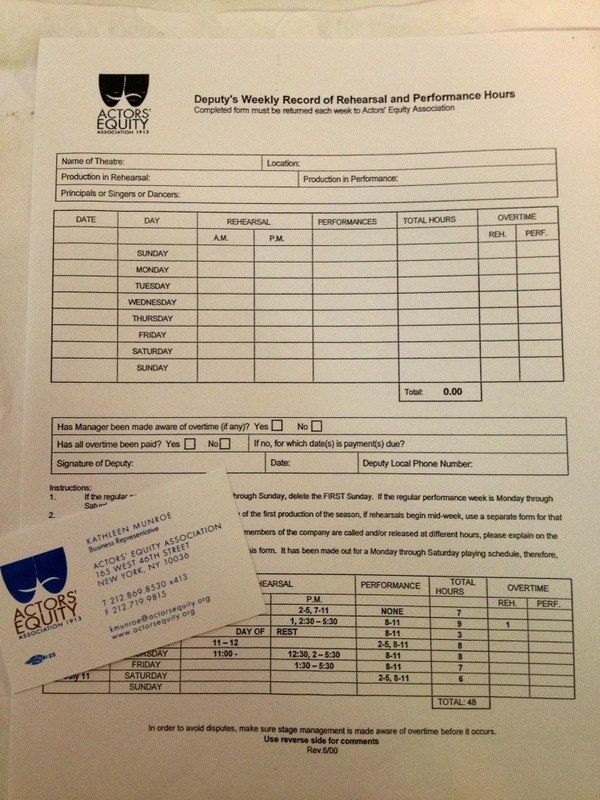 Your major duty as an AEA Deputy, unless your production or producers are a real problem, is usually paperwork. 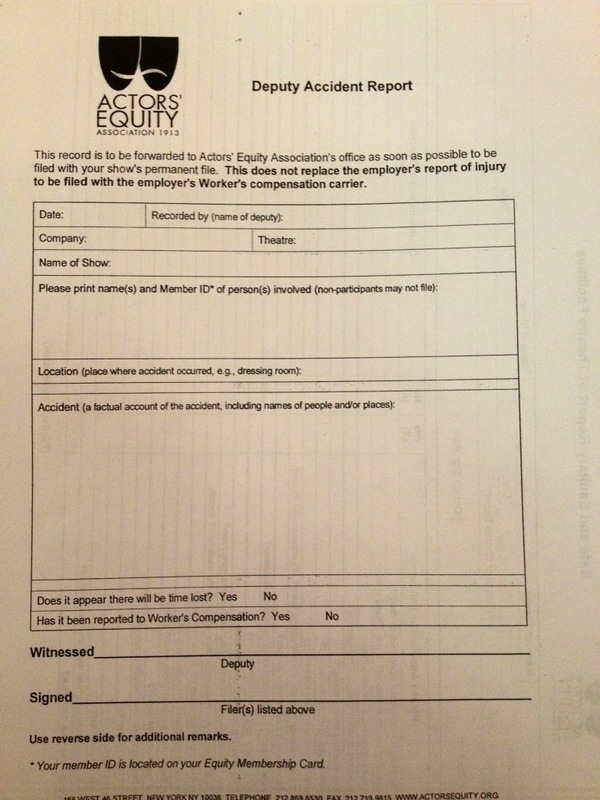 Once a week, you have to send in a rehearsal/performance report to Equity in NYC (they provide pre-paid envelopes), where you report the hours you all worked and make sure there’s no overtime owed. They provide you with the business card of the NY Equity Rep assigned to your production, so you know who to contact in the main office if you have questions. You also need to be very familiar with the contract that you’re working under. 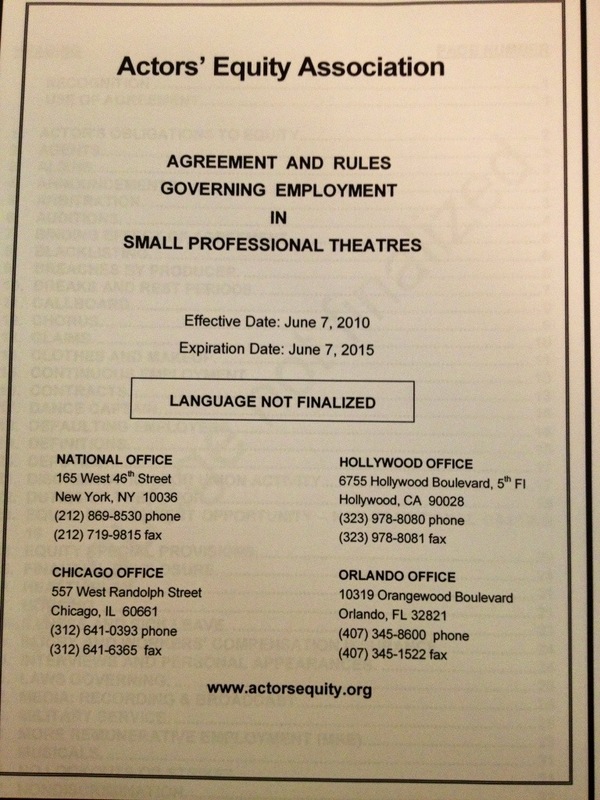 Different contracts have very specific differences, and you want to be able to answer someone’s question when they come to you, whether it be a fellow actor or producer (it has already happened to me). You can feel free to say that you need to check the contract to be sure and take the night to confirm, but it’s always easier if you can just speak confidently about the contract right away. 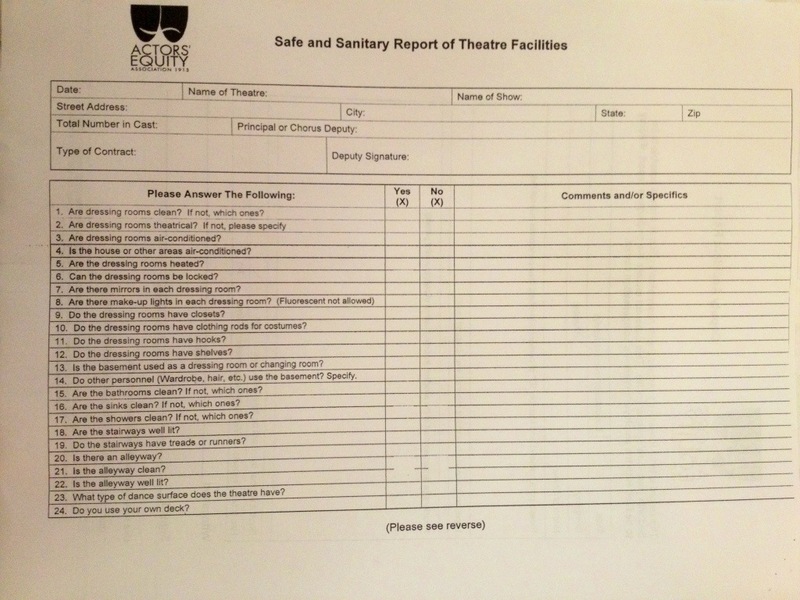 You’ll also need to send in the safe & sanitary report at some point during your rehearsals or run, which is basically just a checklist of the facilities at the theater so that Equity knows you aren’t performing in a dingy, not-up-to-fire-code basement with no dressing rooms. That hasn’t happened to me yet. Be at least vaguely aware of whether or not breaks are happening appropriately, in case there’s a complaint and you need to be able to speak intelligently on the subject. Be organized — take notes when rehearsals going longer than scheduled or are changed or whatever, or you’ll have a hard time filling out that rehearsal report at the end of the week. Know who your AEA rep is (you have his or her business card! ), and return any calls you get from the NY office in a timely manner. Be firm when it matters, flexible when it doesn’t. Be a good listener to all involved. I know that there’s a huge stigma about being the cast Deputy, but I’ve honestly enjoyed doing it. Yes, it is a bit of paperwork and organization. And yes, if your production goes awry, you may be put in a slightly awkward spot having to stand up to the producers. But it’s a great way to learn about inner workings of your union, to take a leadership position, and to get to know your cast members better. Have you ever been an Equity Deputy? Thanks for the post! The Deputy is a very important role, though often (and hopefully very often) a dull one. I have been on productions, and have heard of others, where a situation did arise; if the Deputy wasn’t ready and willing to dive in and serve in their appointed role, things got messy – with the cast, with the producer, with Equity. Good news, too, about the paperwork. Word on the street is they are (finally!) looking at moving it to online submissions. Doing the paperwork online would make SO much more sense. The hardest part of the job sometimes is finding a mailbox, haha. I’ve done it & I’d do it again. Aside from minor bumps along the way, it wasn’t the yoke everyone told me it would be. Maybe it’s just a matter of perspective. I’ve been an Equity Deputy for a regional theatre production. Question, do Off-Broadway shows have deputies?